SolidWorks is a 3D CAD (Computer Aided Design) software application, developed by Dassault Systemes SolidWorks Corp. for Microsoft Windows platforms. Being SolidWorks proprietary formats, the slddrw, sldprt and sldasm file extensions have very few editors or viewers supporting them except the ones provided by SolidWorks. Thus converting them to PDF is an advantage regarding practicability, software support, protection and sharing. Also novaPDF's particular features and enhancements make the conversion from the SolidWorks formats to PDF documents even more suitable for your needs. Password-protect the PDF file automatically when converting to it with novaPDF if your SolidWorks file contains important or sensitive information. That way you can keep the document safe from unauthorized access and other users can only perform the actions you enable on the encryption options. Merge the file with other documents after converting it to PDF using novaPDF. 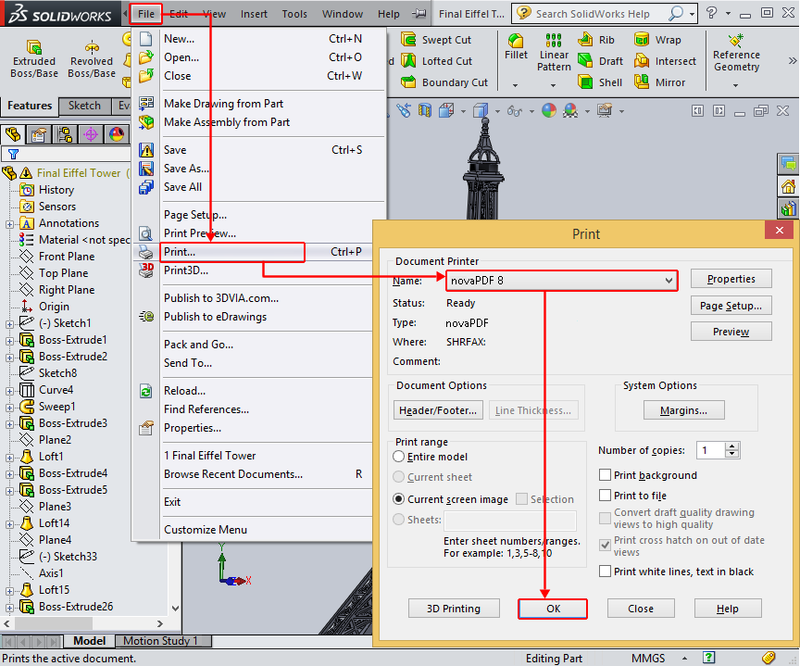 As an example, if you need to add a presentation from PowerPoint for the SolidWorks drawing file, you can print the presentation using novaPDF to the PDF that contains the drawing and the PDF files will be automatically merged. Add automatically PDF watermarks (text and images) to your converted SolidWorks drawing. Make any additional changes to the drawing if needed, then go to File->Print or press Ctrl+P and choose novaPDF from the Document Printer dropdown list. Click OK, choose a location where you want the PDF file saved, enable any additional options if they apply to the document (After save action or Merge with PDF file for example) and click OK again. The drawing will be converted to PDF and will have the features and options you selected for it. Go to File->Print or press Ctrl+P and select novaPDF from the Select Printer dropdown list. eDrawings Viewer is a free application from SolidWorks, allowing the users to view, print and review multiple types of drawing files. eDrawings Viewer also supports additional file formats (AutoCAD files, eDrawing specific files, STL files, Pro/E files and more) aside from the specific SolidWorks ones for reading and printing. It can be obtained for free from the official SolidWorks website. In the Print options section you can choose the number of copies to convert or a custom color for your layout, plus the quality of the resulting PDF. 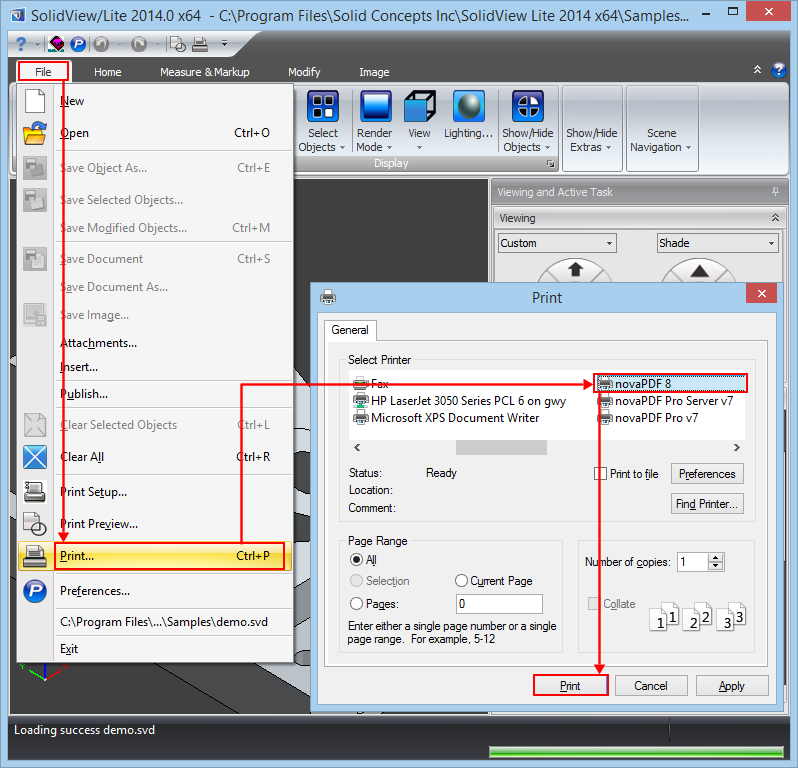 This tutorial shows how to convert the native SolidWorks file formats (slddwr, sldprt and sldasm) to PDF using novaPDF with SolidWorks Office, SolidWorks Viewer and eDrawings Viewer. It also highlights the advantages and features you can have by using novaPDF to convert your drawings. If you have suggestions on how to improve this article add a comment or rate it.